Once there was a summit of all sages who intended to perform a yaga. As they were performing the yaga at the banks of river Saraswathi, Sage Narada came there. He inquired “ Who are you trying to appease by this yaga? Who is the Deva who gives the fruits for these yagas? If you perform yagas with complete knowledge of these, only then you will beget the fruits completely. The sages said “ We worship all the Gods as equal in the yagas. Who is the greater is an irrelevant question.” Narada smiled and said “ One God orders the others . All other Gods are just kinkaras. Do you know amongst all these Gods, which God has sathvaguna and is devoid of lust and anger? On being questioned so Brigu, the sage left for testing the Gods as to who was superior amongst all. Each of them were found to be either with lust or anger but when he reached the abode of Vishnu, he smilingly welcomed him. Brugu, wanting to test him further kicked at his chest. Yet the Lord was full of compassion. 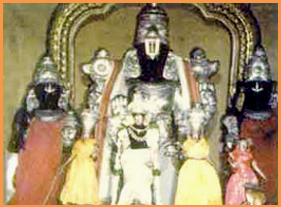 Brugu came back to the sages and declared that Lord Vishnu was the best of all, filled with Sathva guna. Thenceforth all those belonging to the Bhargavagothra became Vaishnavaites. But Brugu was greatly pained that he had kicked the Lord of all Lords. Who was he to test the Lord? Hence he came to the Sravana theertha at chozhadesha and did severe peanance. The Lord appeared before him. Brugu wept for his sin and cried profusely. The Lord appeared before him and said “ I look at the intention of a person alone and not at his activities. Since you wanted to prove my greatness to the world what you did is not a mistake.” Brugu was finally satisfied. Even today there is this kshetra where the Lord appeared for sage Brugu. It is called Thirukannangudi.